Fabulous Camping Products for Gadgety Camping ! We enjoyed our holidays this year and because we ended up taking our tent to a site with electric hookup, we ended up using the campsite WiFi and watched the finals of The Apprentice in our tent ! OK its not what you would call wild camping but it was good fun and added just a little luxury to the holiday. We were also able to charge our gagdets making any car journeys that bit more enjoyable. Here are some products from Amazon that people have found to actually be very useful for camping and are actually listed as bestsellers by Amazon in their camping section. This fabulous small LED light from Rolson Tools costs under £3 has great reviews and we find it really adds a lot of light to our tent. So why not get a few at that price ? OK I know you're still thinking about that Kindle I mentioned ! So if you haven't already treated yourself here are two from Amazon. They both use WiFi to download books from the Kindle store but the more expensive one also has 3G so you can download on the move if you are in a 3G reception zone. So why not give Gadgety Camping a shot and let us know how you find the Kindle. I find I can read well with one even though I am a slow reader - what about you - let us know what you think ! 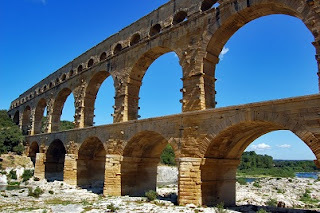 Here is a list of all the World Heritage Sites in France as listed by UNESCO, the United Nations Educational, Scientific and Cultural Organization. 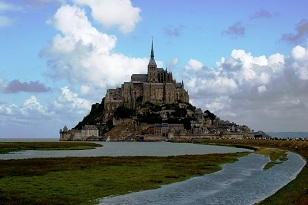 Currently, thirty-seven properties in France are inscribed on the World Heritage List. Thirty-three of these are cultural properties, three are natural properties, and one is mixed. These are the ones currently listed and I have put the Region afterwards so you can see if you are going to be holidaying nearby. Have you been to see any of these and what are your memories of them - which ones would you recommend to other holidaymakers ? A Review of Trip Advisor, Review Sites and Reviewers ! I've just been reading some reviews on Trip Advisor ! It is a fantastic resource for researching a holiday but some holidaymakers' seem to have unreasonably high expectations ! And I have to say some people give themselves away when they give bad reviews ! For example I've just been reading one where a caravanner complained about unhelpful staff at a French campsite who said he had to be packed up and away by 12.00 including being out the barrier of the site. He apparently threatened to block their barrier if required to be away by 12 ! However, what does he expect ? Every campsite I have been to expects you to be away by 10 am. Sometimes this might be so they can cut grass etc before next arrivals in the afternoon. If you are still rushing around packing beyond this time then I am always thankful that so far no-one has ever complained or charged us more ! This year in Cornwall we actually packed a day early as there was high winds and rain threatened in the forecast so we decided to use a day we had already paid for and packed at leisure and left about lunchtime. Other comments I have seen in reviews included a site in France which had been taken over by new owners. In fact it is the excellent site in the Vendee that we stayed at last year. The previous regular campers at the site wrote a review that they were very disgruntled to be evicted from the bar at 1 in the morning ! However I was glad to hear about a site that was strict like this - there is nothing worse than a few people keeping a whole site up at night as they make their way home from the bar ! And then there was a review from people with one of these mega motorhomes - 30 foot long ones - who were complaining about the very tight streets and bridge to get to the Camping International site in Paris ! As though the historic older buildings in Paris were actually put there by the campsite owners just to annoy them ! However I am sure that reviews like that are useful to people who are planning their route in large motor homes ! Another point which reviewers have highlighted about a number of French campsites is that in the busy months people are queuing early in the morning to put their towels on the sunloungers which they are not using immediately - surely the staff at the campsites could come up with a simple system to allow people to use sunloungers for maybe an hour at a time ? It can't be that difficult can it ? Something like the coloured arm band system which some swimming pools use so that you can stay in the pool for a certain amount of time but no longer ? Another common moan from people is that "the campsite shop is very small and overpriced !" yet they go on to say that "we only managed to get some bread, meat, milk and newspapers" etc. Well really what do they expect ? In the campsites we have stayed in I would say they all provided a pretty good shop and in one case it was almost a mini supermarket. They have always had sufficient food in stock for you to make a meal if you havent managed to get to the supermarket. And they have usually had fresh bread and croissants. Review sites can definitely be worth reading as long as you bear in mind that it can often depend on the character and expectations of the holidaymaker who is writing the review ! So lighten up campers and enjoy your holidays without having such high expectations! Relax and enjoy ! And let us know what you think of these Review sites - Have you picked holidays by reading them ? Did you find them useful ? Blue Green Algae - What are the Dangers ? Excessive blue green algae has been a problem in various coastal and river estuary areas of France for a number of years. Although the algae is harmless while at sea, the danger is from the hydrogen sulphide gas that is given off by the algae as they decompose when they form in large quantities and when they end up out of the water and decaying on the beach. So far this year there have been deaths of 30 wild boar in an estuary in Brittany (http://www.bbc.co.uk/news/world-europe-14324094) and (http://www.francesoir.fr/actualite/scienceecologie/algues-vertes-mysterieuse-hecatombe-sangliers-bretons-122622.html) and this month the deaths of two dogs on the Tarn River in the Lozère region in the South of France (http://www.francesoir.fr/actualite/faits-divers/tarn-baignade-mortelle-pour-chiens-124642.html). Blue-green algae (cyanobacteria) are natural inhabitants of many inland waters, estuaries and the sea. In fresh waters, they are found in suspension and attached to rocks at the bottom of shallow water and along the edges of lakes and rivers. In small numbers they are important and useful parts of the aquatic ecosystem. They convert energy from sunlight into chemically useful forms, liberate oxygen into the water, take up minerals and produce substances which enter and support food chains. Like other floating plants, blue-green algae need nutrients to grow, particularly nitrogen and phosphorus. If the water is enriched with nitrogen and phosphorus, for example from excess farm fertilisers ending up in the water and if there is also enough sunlight , a suitable water temperature and the water flow is not too hight then the numbers of blue-green algae can become excessive. Such extensive growths are sometimes referred to as BLOOMS. Such algal blooms sometimes cause foaming on the shore-line and during calm weather they can form a SCUM. They may also use up so much of the oxygen in the water that this can be a problem for fish. Depending on the exact species involved, scums may appear blue-green, grey-green, greenish-brown or occasionally reddish-brown. All blue-green algae contain blue pigment in addition to green chlorophyll pigment, although the blue colouration cannot normally be seen in the living cells. However, when blooms and scums decay, the pigments are released and a bright blue appearance may persist for days or weeks. Blue-green algal scums can form quickly on calm days, but can be dispersed rapidly if wind and wave action increases. For reasons which are not yet fully understood, bloom and scum forming blue-green algae in freshwaters, brackish water and seawater are capable of producing TOXINS. These toxins have caused the death of wild animals, farm livestock and domestic pets in many countries. In humans, rashes have occurred following skin contact, and illnesses have occurred when blue-green algae have been swallowed. Blue-green algal blooms and scums are not always toxic but it is not possible to tell from its appearance whether or not a bloom or scum is harmful. It has been estimated that 50% of blooms could be toxic. Waterusers, particularly children, farmers and pet-owners should treat all blue-green algal blooms and scums with caution. A massive beach cleaning effort operates on many beaches in the Brittany area and in some places it takes up a third of a town's budget just to clear this stuff. The men or women who operate the machines wear gas monitors at all times and if these alert the to high gas levels they have to stop work. (http://www.bbc.co.uk/news/world-europe-14182135) It is a problem which towns do not want to shout too much about in case this would then affect the tourist trade, but there were recent calls for the French national government to help to tackle the problem. Excessive nitrates used as fertilisers by farmers are blamed as these run off the fields and into water courses. The algae then feed on these nutrients. A solution may be a move to more organic or natural farming methods eg a return to leaving fields for a year of fallow with clover grown to add nutirents to the soil perhaps ? Raised water temperatures perhaps from global warming may also be an additional factor. Could children be in danger ? Well yes, possibly, as small children are the same size as some of the dogs who have died. So it is important to take note of any warning signs and maybe avoid areas with excessive seaweed or algae unless you know how to identify the dangerous types. In the Lozère area they have recommended that the smallest children do not bathe in the area where the dogs died in the Tarn river. More information should be available in the locality where you are holidaying. However lets hope this problem gets sorted out soon ! NEWS UPDATE - 10th August 2011 - The French Minister for Ecology, Nathalie Kosciusko-Morizet, has ordered the closure of all beaches with green algae, which cant be cleaned within 24 hours. 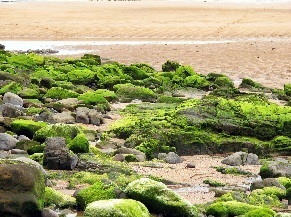 Have you come across any algae while on holiday or did you come across warnng notices ? Let us know what your experiences were and would it make you avoid holidaying in certain areas ?